Chairman Chung Mong-Gu of Hyundai & Kia Motors received the highest award from Mongolian President Natsagiin Bagabandi on July 8, 2004 when he visited Ulan Bator at the president's invitation. Of all 140,000 vehicles in Mongolia 90,000 were produced by Hyundai & Kia Motors. Chung also got honorary doctor's degree from National Univ. 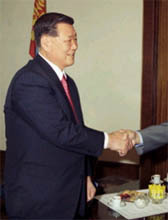 of Mongolia in 2001.